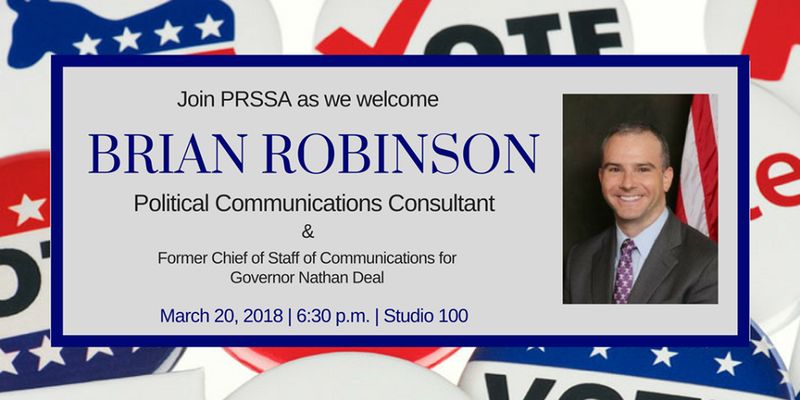 Brian Robinson, Grady alumni and Former Chief of Staff of Communications for Georgia Governor Nathan Deal, joined PRSSA Tuesday night to discuss political communications. Robinson graduated from UGA in 1997 with a Newspaper Journalism degree, then went to work for the Atlanta Journal-Constitution for five years. After getting his feet wet in a political campaign in Georgia, Robinson relocated to Washington, D.C, where he worked for seven years under two different congressmen. During his time on the Hill, social media was just being introduced to the world and the digital landscape for communications was rapidly changing. He learned to navigate the changing press landscape very quickly, although he believes that the traditional news media is still very relevant today when working in campaign communications. Gov. Deal went on to hire Robinson as his Chief of Staff of Communications after winning the election, and Robinson worked in Deal’s office for a number of years. Recently, Robinson left Deal’s office to start his own consulting business, where he has worked on countless campaigns since, advising his clients on communications strategy, media training, writing earned media content, speeches and any other form of communication a campaign requires. One of his current clients is Georgia’s Lt. Gov. Casey Cagle, who is now running for Governor in 2018. “This industry is about understanding your audience and speaking to them with the strongest arguments,” said Robinson. Robinson is poll-driven when it comes to talking about topics that interest the voter. He always relies on data rather than his own intuition when deciding which strategy to implement. He says that you cannot assume that how you feel about a topic, or how you think a topic should be presented, is the way that a majority of the voters feel about a topic. You must rely on research and data to back up your arguments, and to know how to present your arguments, where to present them, and through which mediums to present them.